Apr - 27 | By: admin | 4 comments. Looks great – but which settings do you use to enable post headings / titles to run onto two lines? And widen main post box to allow standard Youtube clips? Sorry, I’m a noob. Please help! how to extend header_menu_current.gif to the end? like blue one? 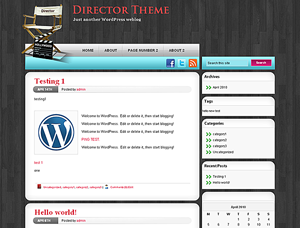 Hello, send me more details of what you need to do, to webmaster (at) wpthemesplanet (dot) com. Cheers. Alex.